Nearly one in four jobs outside of London pay less than the living wage - the pay level suggested for an adequate standard of living. Some 23% of jobs outside London paid less than the living wage in 2014, compared with 19% in London, the Office for National Statistics (ONS) said. The living wage in April 2014 was £8.80 an hour in London and £7.65 an hour outside London. This wage is set by the Living Wage Foundation and Mayor of London. The living wage rates have since been increased to £7.85 an hour outside London and £9.15 in London, and are expected to be uprated next month. The ONS figures show that the proportion of jobs paying below the living wage has grown. In 2014, young adults were most likely to be paid less than the living wage. Some 58% of jobs carried out by 18 to 24-year-olds outside of London and 48% of jobs in this age group in London were paid less than the living wage. In accommodation and food services in 2014, an estimated 65% of jobs paid less than the living wage in London and 70% in the rest of the UK. 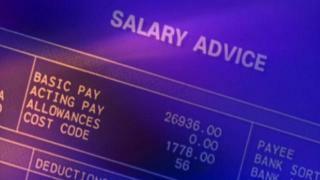 Northern Ireland had 29% of jobs paying below the living wage, the highest in the country. At the other end of the scale, 19% of jobs in the South East of England, London and Scotland paid below the living wage. A spokesman for the Living Wage Foundation said: "Despite significant progress in many sectors, more jobs than ever are below the voluntary living wage rates that we recommend. "These figures demonstrate that while the economy may be recovering as a whole, there is a real problem with ensuring everyone benefits, and low pay in still prevalent in Britain today." The living wage is a voluntary code - different from the national minimum wage, which stands at £6.70 an hour, and the new National Living Wage announced by the government of £7.20 an hour which will come into force for over 25-year-olds in April. There are more than 1,800 accredited living wage employers in the UK, with 200 having agreed to pay at this level in recent months.